The product you are about to order is not highly caustic and is biodegradable. Nonetheless, there are hazards in using any type of chemical, even household bleach. 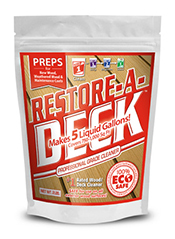 The main cleaning compound in Restore-A-Deck deck cleaner is sodium percarbonate, better known to most by a brand name called OxyClean™. 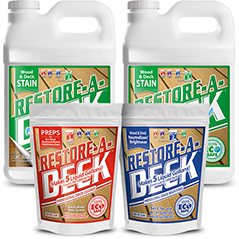 In addition to the sodium percarbonate, there are other proprietary chemicals that assist in cleaning, killing mold growth and lightly removing existing finish. 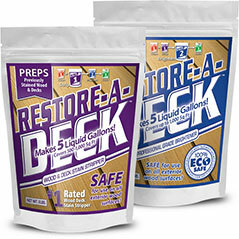 The following are true of Restore-A-Deck Cleaner. Protective gear should be worn. This includes hand and eye protection. Long pants and a shirt with sleeves are added precautions. It is mildly irritating if left on the skin. Skin should be flushed and/or neutralized with water or lemon juice if skin contact is encountered. An eye wash is also recommended to have on hand. Some darkening of wood may occur if the cleaner is not followed and neutralized with Step-2 BRIGHTENER. It has an acidic pH balance and is a blend of citric and oxalic acids. By itself, it can be used as a maintenance cleaner if wood is not going to be sealed. Protective gear should be worn.This includes hand and eye protection. Long pants and a shirt with sleeves are added precautions. It is irritating to some when breathed. 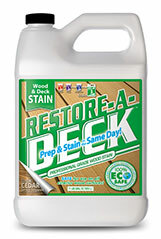 The blend used in Restore-A-Deck Brightener is safer than straight oxalic acid and also less harsh to the wood. 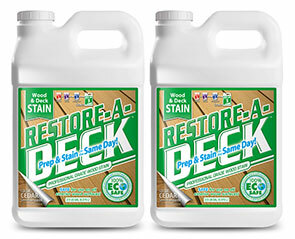 Do not allow Restore-A-Deck Cleaner or Brightener to dry on plants, glass, siding or furniture. 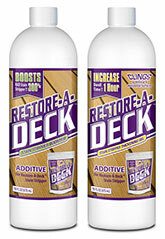 Deck surface may become slippery from melting mold or finish. Exercise caution when walking. I have stained cedar shutters on a painted brick house. I also have stained cedar pillars where the base of them is a faux brick finish (some type of compressed foam composite). Is there any concern in using this product knowing it will make contact with those surfaces? The prep products should not be an issue. 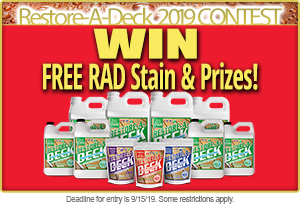 Does the RAD stripper or RAD brighter contain any Methylene Chloride? I may have screwed up a bit, I had some overspray from my cleaning/brightening that made contact with my siding... although diluted what would occur if it drys? Should be fine as long as you rinse well. One last question. You guys have been awesome by the way with the help to my questions. How long is the sealed stain good for and if the containers been opened how long? Unopened, a few years. Opened is 12 months. It does need to be stored where it cannot freeze. Does the product contain Methylene chloride? I have a gazebo with metal posts mounted to my deck. 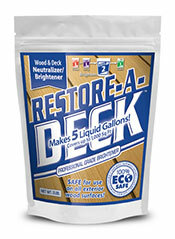 Are there any precautions when using restore-a-deck around these painted metal posts? Most likely there will not be issues but always do a test spot first to be certain. I have a roof top deck in Boston that I am preparing for restoration. I would like to use your restore a deck step 1 and step 2 products. However, my roofing material is rubber, will the chemicals in products harm the rubber roof? Thank you Scott, that is good to know.